stomach. In a minority of people it may cause peptic ulcers. The two main causes of ulcers are certain painkillers or antiinflammatory drugs (like aspirin and ibuprofen). H. pylori is not thought to be a major cause of pain, indigestion or other symptoms in people without ulcers. H. pylori is prevalent in up to 54 per cent of the population in developed countries. For people with peptic ulcers, the discovery of H. pylori has been a major help in the treatment of their condition. Previously peptic ulcers could not be healed, and commonly recurred. Nowadays, if H. pylori is successfully treated ulcers seldom recur. A tiny minority of people with H. pylori develop gastric cancer. How do people get H. pylori, and can it be spread from person to person? No one knows exactly how you can catch H. pylori. In most cases it is thought to be caught in childhood but causes no problems until adult life. In the past H. pylori was common in many children, which explains why many adults have it today. Now it is very uncommon for it to be passed from adult to child or from adult to adult. 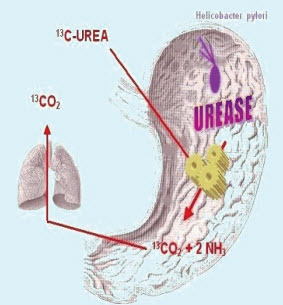 What is a 13C-Urea breath test? It is a simple way of testing for Helicobacter pylori bacterium. Your breath test may not be analysed immediately, because samples are checked in batches. You or your GP will be contacted with the result or you may be given a clinic appointment to discuss the result. If you have previously been treated, but still have H. pylori, you may need another course of treatment. The antibiotics will be different and the treatment course may be longer, but the chance of success is still high. Re-treatment after treatment failure is usually carried out with the advice of a specialist doctor. If there is anything else you would like to know, please ask a member of the Pharmacy Team. If the person carrying out the test does not know the answer they can easily find out for you.